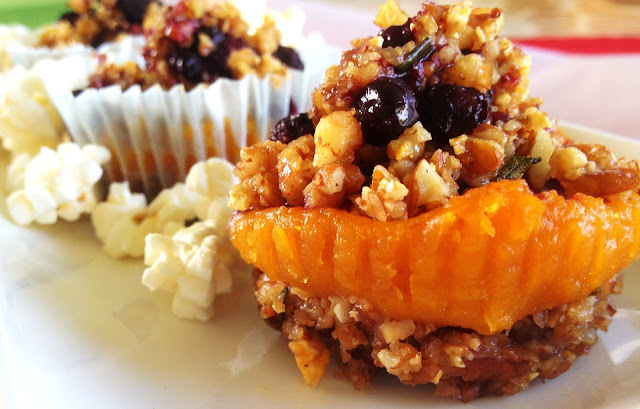 This turned out so delicious: savory and sweet with a little bit of a tangy flavor. 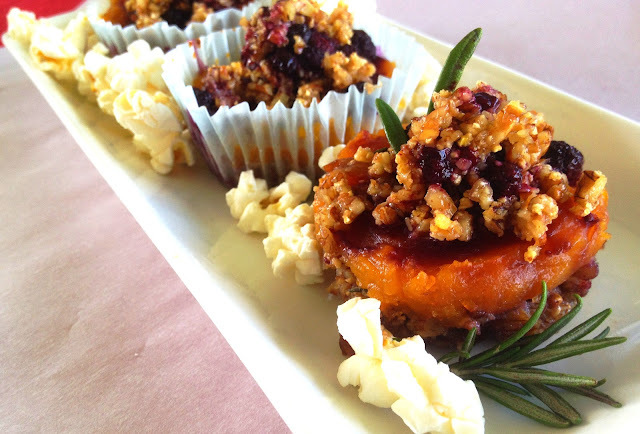 I could totally eat both the popcorn, pecan, and rosemary crust and the butternut squash apricot filling separately on their own, but when you put both of them together, it really makes a statement. Yum! 1. 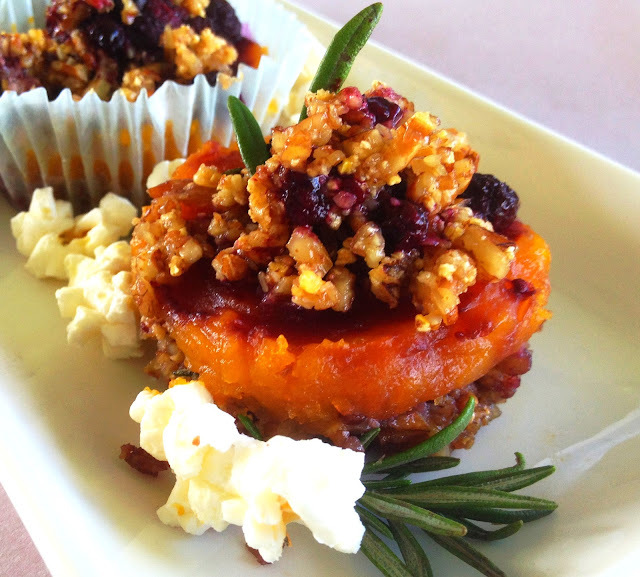 Roast your butternut squash in the oven on 400 for 45 to 50 minutes. Remove from oven and let cool for 10 to 15 minutes. 2. Add the pecans, popcorn, brown sugar, and rosemary to your food processor. Sprinkle with a tiny bit of salt. Process the mixture until it has formed into small crumbles (pictured above). Pour it into a medium bowl, and mix in the melted Earth Balance spread. 3. Add the roasted squash, apricot preserves, and brown sugar to your processor and blend until smooth. 4. In a small saucepan, add 1/3 cup water, agave nectar, and the frozen berries. Bring to a boil, let cook for a few minutes until it has thickened a little. Remove from heat. 4. Spoon the pecan mixture into a lined cupcake pan, filling each individual cupcake tin about 1/3 of the way up. 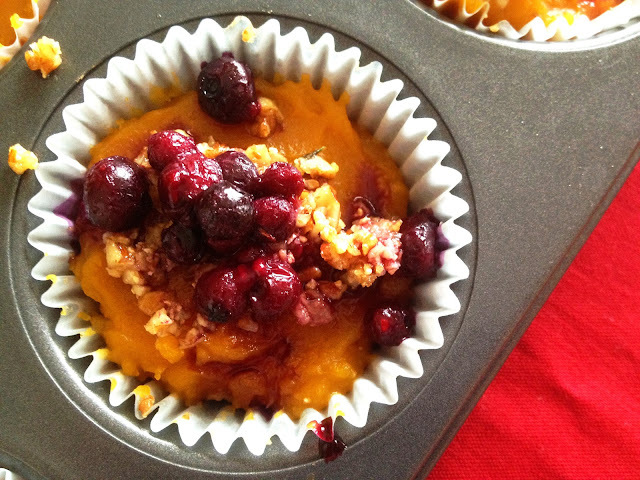 After that, spoon the squash and apricot mixture on top, filling the cupcake tins. Drizzle about a teaspoon of the berry mixture on top of each tart, and top each tart with the remaining pecan mixture/crumbles. 5. Bake at 350 for 15 to 20 minutes. Let cool in fridge for at least 30 minutes. 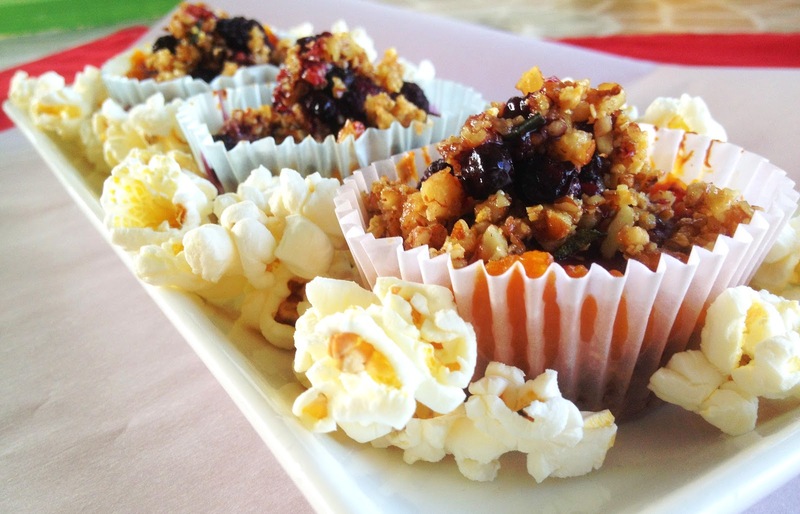 Garnish with popcorn and rosemary! I hope you like it...let me know what you think!!! ❤❤❤☺☮ PS: These are gluten free. I'm definitely going to try out the popcorn tart base. What a brilliant idea!! Lol. That's true. Pictures are absolutely necessary in life. Lol. I'm glad you like it! My friends have been going crazy over them!